2012 Machins nearly complete - 2nd Large booklet of 4. 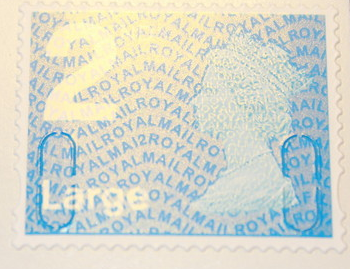 The 2nd class Large letter stamps from booklets of 4 with MA12 year code has been spotted on eBay. This shouldn't be scarce as so many stamps were purchased in April before postage rates increased and stocks were seriously depleted. Thanks to our reader for the tip-off. We'll let customers know when this is in stock. This printing could be scarce as most of the offices that I visit on a regular basis have stock with pack dates of 2009/10 on so are not like to be ordering any new stock for some time to come. Collectors might well have to wait for this if they want to get it in there local offices. Thank you Brian. Somebody else has said that some London Post Offices are still using 'lick-and-stick'pre-security PIP 2nd Large, and that business sheets are very slow movers. All I will say is that somebody must be buying the booklets, else they wouldn't have been printed. It may be that the place to go is Staples, who not only sell them in store but by mail order. Thanks Doug. That's interesting about Staples. They may have bought in large stocks originally - not good for cash flow - or before the large increase in April (much more sense) before stopped by RM distribution. Odd that what they were using was 2008, though - maybe RM had cleared out on the 'last in first out' principle and had reached rock bottom (hence the new versions)?